Leading pan African e­-commerce Jumia announced yesterday the launch of JumiaPay, a third party online payment solution aimed at providing a safer, faster and more convenient online payment experience. The online payment solution JumiaPay is a first for e­-commerce Jumia and will most certainly be decisive in facilitating online payments across the 23 African countries where it operates, encouraging the progressive change to cashless societies. If the majority of payments performed on Jumia’s platforms is cash on delivery (between 70 to 90%), JumiaPay comes as a major milestone for improving customers’ online experience for the coming months and years, following in the footsteps of Chinese e­-commerce Alibaba and its online payment platform AliPay. Jeremy Hodara, co­CEO of Jumia, emphasized the value added of the new payment platform for the online customer: ​ “Jumia Pay has a very simple yet crucial objective: go even further in providing a safe, a secure and a convenient shopping experience to our customers, building trust along the way between us, our thousands of sellers and our millions of customers. We are very proud to be able to offer this new service to our customers and participate in building financial inclusion in Africa to unbanked or underbanked populations”. JumiaPay will first be implemented in Jumia’s biggest market, Nigeria, with more innovations to come before the end of the year. The advantages of mobile money are central for e­commerce in African countries where mobile penetration is soaring and where the main challenges are to build trust for the customers and provide adequate payment systems. Indeed, already 50% of Jumia customers access the different platforms via their mobile phone, that figure reaching 70% in Nigeria. With its very secure payment system using a confidential code, mobile money payment is among the most trusted forms of payment across Africa. Mobile money also offers many perks for the customer. First, the transfer is instantaneous and cheaper than any bank transactions. Second, payments via mobile money do not require the user to have a bank account, something decisive in 19 African countries where the population has less bank accounts than it has mobile money accounts. 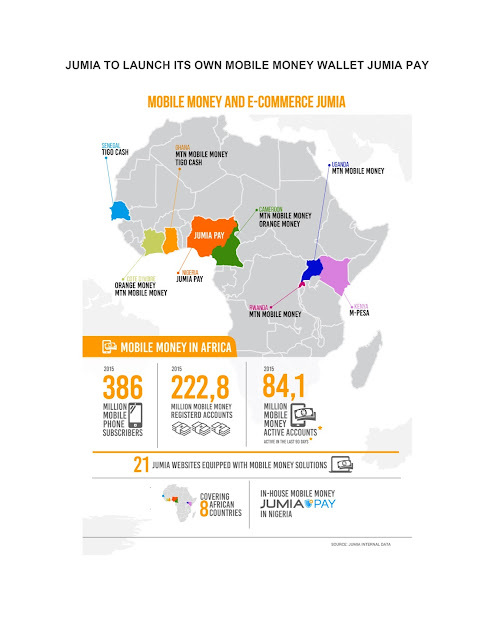 Jumia has also collaborated with leading telecom companies MTN, Orange and Tigo to launch their own mobile money solutions on 20 of its platforms, spread across 8 African countries (Senegal, Cameroon, Ivory Coast, Ghana, Rwanda, Uganda, Nigeria). JumiaPay will undoubtedly be a stepping stone in ensuring safer transactions between customers and Jumia benefit greatly the thousands of local businesses and vendors who sell daily on the many platforms of the company, helping them connect in a more secure and convenient way with their customers.